Exhibited in Seven Museum Exhibitions: SHAKEN, NOT STIRRED: Cocktail Shakers and Design. 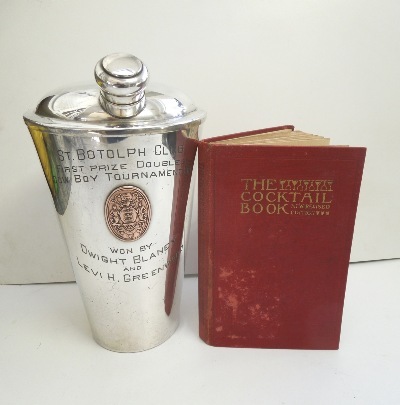 A Sideboard Manual for Gentlemen, Issued for THE ST. BOTOLPH SOCIETY. Established 1880. Art Society Club and still in existence today. Copyright 1900. this is sixth printing 1928. Stamped Underside "N.G. 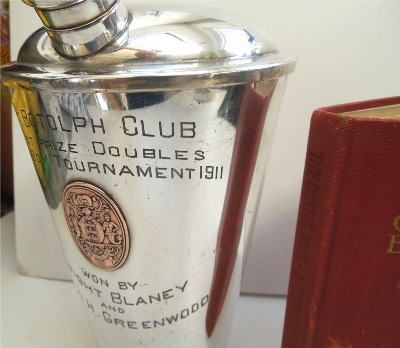 WOOOD & SONS MAKERS BOSTON MASS"
Engraved: "ST. BOTOLPH CLUB FIRST PRIZE DOUBLES COW BOY TOURNAMENT 1911 WON BY DWIGHT BLANEY AND LEVI H. GREENWOOD." THE COPPER MEDALLION ON FRONT IS THE GREAT SEAL OF ..THE ST. BOTOLPH CLUB. Dwight Blaney was a FAMOUS AMERICAN ARTIST who painted in Fenway Studios in Boston 1906-1943. And he himself was painted a few times by his friend John Singer Sargent on Ironbound Island. The Island, in Frenchman's Bay, 3 miles off Bar Harbor, was purchased by Blaney as a summer retreat for his family. Blaney was born in Brookline MA in 1865, Originally trained as an Architect,.. He was encouraged by his friend John Singer Sargent to travel to Europe and paint, where he was influenced by Monet and The Impressionists. Levi Heywood Greenwood (1872 - 1930) Was President of the Massachusetts State Senate in 1912 & 1913. Publisher & President of The Gardner News, Gardner Mass. In 1912 Greenwood was one of the Directors of Heywood Brothers and Wakefield Co. Manufacturers of Rattan & Reed Furniture in Gardner. By 1921 Greenwood was one of the owners, and by 1926 he was the President of The Haywood-Wakefield Company.